The Nantahala community and Nantahala Lake are located on the western boundary of Macon County, North Carolina. The town of Franklin, county seat of Macon County, is approximately 18 miles east and is known for its gem mining, antique shops, art galleries, museums, shopping and fine restaurants. Other nearby towns include Andrews, Robbinsville and Bryson City. The Great Smoky Mountains Railroad, Cherokee Indian Reservation and Great Smoky Mountains National Park are about an hour away. 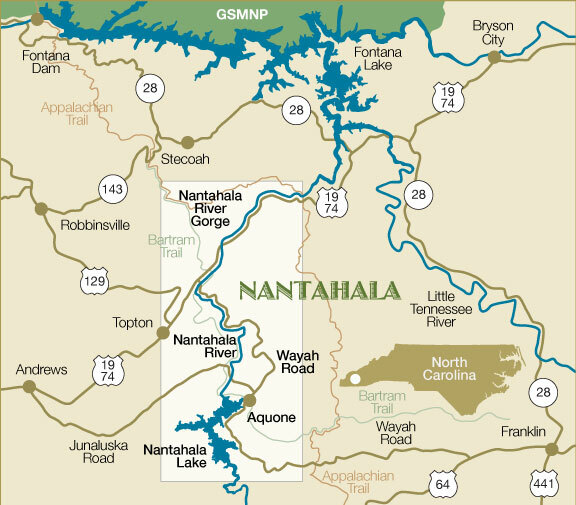 The Nantahala community is a two hour drive from Asheville, Chattanooga and Knoxville; and three hours from Atlanta. The closest general aviation airport is the Western Carolina Regional Airport (KRHP) with a 5,500 ft. runway. 828-321-5114. Rental cars are available.